We know that Jesus spoke these words almost 2000 years ago. But when we listen to them carefully and understand what Jesus is saying – it seems that He really is talking with us. We may be separated from Jesus and His listeners by two millennia, but essentially we are exactly the same as His listeners. Yes, different language and time, different culture, technology, but in our core we are the same. This passage deals with the oldest problem of man, where to put your trust? Where to put my trust? On God Creator and Redeemer or somewhere else. As in this parable, on God given possessions. Let’s go through these words of Jesus and see, what He is teaching us. Right before these verses we can read that Jesus was teaching about the importance of confessing our faith, about the Holy Spirit and about persecutions of faithful. This is so sad request. There are two brothers and they are having a problem to divide their inheritance. Usually the oldest was responsible for it. We can conclude that the speaker is the youngest brother who is looking for some support. Obviously their relations are already broken. They can’t agree. As two children can’t agree on how to share a new toy. I see it so often. This man didn’t come to Jesus asking for a help to reconcile with the brother. No. For him, it seems, there is no interest in reconciliation. He is interested in the inheritance. His brother and relations with him are trumped by desire to obtain larger share of the inheritance. Jesus didn’t come to take sides in our arguments. He didn’t come to fix problems like this. He came to fix… this broken world. To restore it. To be with us. To give us joy and peace, meaning and purpose that comes from being with Him. He came to lay down His life so that we can learn what kind of God He is. What is His attitude towards us. So that we can be saved from the power of sin, Satan and death. All of us, yes, all of us. One thing we need to make clear in the very beginning. Jesus is not teaching that to have possessions, to have money, to have good, growing businesses is bad. Poverty good, prosperity bad. No, no, no! In Biblical understanding this material world is good. It is created by God. Very good, according to Creator’s evaluation. We all are called to take care of this world. To care for our neighbors each of us in all relations where God has put us, and with all the gifts that He has given to us. To live a prosperous and abundant life according the Biblical worldview is a good thing, a blessing of God. For how can you take care of others, how can you be generous and supportive if you don’t have enough for yourself? Apostle Paul, too, encourages us to work hard so that we can help those in need. 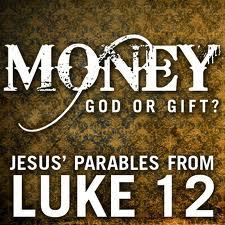 Briefly – to be rich, to have possessions is in no way a bad thing according to the Biblical worldview. The issue Jesus is dealing with in this parable is quite different, though it is closely related with our material goods. If we do well, we think these are the fruits of my labor. If we fail, then this happened because of a bad season or some unfortunate circumstances . We assume that good results are results of our wisdom and efforts. Bad results… because of someone or something else. Not because of us. ‘I’ll tear down my barns and build larger one. There I will store my grain and my goods.’ He is smart. Really smart bloke. If he lived today, everyone would like him. Or, at least, would envy. He has got a really good harvest. He already was quite wealthy guy, having several barns. What is he going to do now? He is not building new barns on his land. Thus he could lessen next year’s harvest. No, he is building new ones instead of the existing ones. Smart. Besides, he is not going to sell his crop right away. When you have a good season, prices drop and entire community can benefit from this good season. Not in this case. He will keep price us. He will maximize his profit by maintaining the price. Good businessman. Smart guy. Why is this dream so popular? Answer is found in Genesis 3. The fall. After man wanted to become like God he lost what he had. Access to the source of life, for God said: “He must not be allowed to reach out his hand and take from the tree of life and eat, and live forever. (Gen 3:22) Because of sin we were separated from God’s life giving and holy presence and we faced death. The answer to the question why is this dream so widespread is – because of the fear of death. Because we fear the death! This may sound strange at the first sight. What has our desire to have more to do with the fear of death? But just think for a while. What is this fear? Fear that we won’t have enough. That we’ll be without means of existence. Unable to provide for ourselves and for our dear ones. Unable to sustain our life. Unprotected. Vulnerable. Depending on others… depending on God’s grace and provision. Not in control. As I already said. There is nothing inherently bad about being rich and living in prosperity. No. Not poverty and want, but total, all embracing wellbeing, shalom, peace, that is God’s intention for us. Just think about what abundance our first parents had in Eden, and what an abundant life we are going to enjoy after Christ’s return. The Bible speaks about it as ongoing feast in God’s presence. We are going to enjoy it. Yes, we. Then what is wrong with this man when he wanted to get at least a part of it already here? Answer is simple. He misplaced His trust. He lost the big picture. He forgot to whom everything belongs. We can see it happening everywhere. Money, possessions, businesses… they all seemingly can provide what God took away from us. They seemingly can protect us from death, from want. If God doesn’t give us life, we’ll take is on our own! Right? Listen carefully, this is so important. If only we can grasp this then we could be able to make a first step towards our freedom. Everything belongs to God. He has promised that He will give us our daily bread. That He will take care of us, that He will grant us whatever we may need. He can, He is God Creator. But we don’t believe Him. We don’t trust Him. In our hearts we assume that He is a liar. That He won’t do it. Thus we spit on the 1st commandment, where God offers to be our God and to give us everything we need. We want to be like gods ourselves. We want to control and secure everything we think we need. But we can’t do it on our own. We need created things to help us. We need wealth, possessions, businesses, money, savings, large houses to help us to gain this control and security. I’ll remind you once more. All of these are good and wonderful things, blessings of God, if properly received and used. But we tend to put our trust on these things, instead of the One, to whom they all belong. Isn’t this ridiculous? Now listen. We don’t trust God, we make Him a liar, we trust that these created things will give us what God Creator wouldn’t. And we think that we are in control of them, that we control our wealth. If fact, it is vice versa. By expecting from created things what only Creator can grant, we have made these good gifts of God into idols. And now, not we control them and our lives, but they control us. We have made good gifts of God into idols. We have personalized them. They are in control of us. They require. We are enslaved to them. Not we, but they determine what we need to do. And we know how it works. Once we start to put our trust on created thinks, they will require more and more. When we are blessed with a rich harvest, successful business, or other kind of God’s gift… what do we think? Great, we have been so blessed. What does God want me to do with it? There are so many people who haven’t heard about Jesus and salvation, let’s plant a new church in Sydney. No, let’s support missionaries in Islamic countries, where people risking their lives share the Gospel of Jesus. Or, there are so many needs even here in our neighborhood, let’s try to address at least few of them. Or maybe we think. Finally I can get a larger house, larger than my neighbor, or buy this new thing I desired for so long, or to expand my business so that next year I can get much more out of it, or may be let’s save it, so that I can be sure I have goods for many years. Which of these two ways of thinking seems to be more familiar to our heart? I vote for the later. Unless we realize how idols work and unless the Holy Spirit gives us freedom, this is a way our hearts operate. Instead of trusting God, we want to trust ourselves. Then we need some help from created things, money, possessions. Then we make them our idols and become dependent on them. Then they, and not we or God, rule our lives. And what happens when we get more? Do we become free? No! The larger our idols grow, the more possession we have, the more money, the larger houses, etc., the more dependent we become. Our idols, they grow stronger. And the stronger they grow the larger is their control over us. Where it leads? Jesus described it beautifully. In Ancient Middle Eastern culture people used to discuss everything. Everything that happened was relevant for a community and was talked about in a community. What about this man? Did you notice with whom He was speaking? “What shall I do? I’ll do this. Then I’ll tell to my soul.” With whom is he talking? That’s right… he is talking to himself. He has no one else to talk with. He is alone. Alone with his idols. You probably could come up with many examples showing this trend. The stronger our idols grow, the more we are controlled, the lonelier we become. Desiring to be free from fear of death, refusing God’s grace we chose to enslave us to created things. When we have a lot, then we think we are so smart. We don’t control our lives. We don’t control our environments. Instead of trusting God who does it, we chose to enslave us to created things. Is this a wisdom or foolishness? Do you know who are these, who say that they don’t need this crutch, this God? Those, who are hopelessly and foolishly enslaved to their idols, real crutches. This is why Jesus had to say these harsh words. Fools! If you only lay treasures for yourself and are not rich in God. Jesus doesn’t call us fools because He wants to humiliate us. He speaks to us so that we can see the truth. Because He loves us. So that in the light of God’s word we can recognize our situation. Jesus speaks these things to us, so that we can accept true freedom that only He can give us. When we are baptized, when Jesus takes all our sins away, when our relations with God the Father are restored, we can be free again. Because we again have the access to the sources of all life. We are free to trust God Creator, instead of trusting creation. We don’t have to fear death. Jesus said: “I’m resurrection and life. He who believes in me will live.” (John 11:25) We don’t have to sell out our freedom to serve idols hoping that they will give us life. We are free to be with God, who is the source of life. We can trust Him. We are free to go and to make good businesses, to have a plentiful harvests, to have possessions, and to enjoy them as good gifts of God; not serving them, but serving with them the living God and our neighbors. Jesus has promised to take care of us. His Spirit in our hearts assures us that we can trust Him. If He was not reluctant to give up His life for us, how much more He will give us our daily bread. We have this Holy God. He has rescued us from slavery to idols. Look at your lives, He has proven countless times, that we can trust Him. He is faithful God. He is our God, and we are His children. Created and redeemed for life in abundance and joy in His presence. And as His beloved children, as His heirs, we can ask ourselves this question. When our souls are required from us, whose will be the things God has so abundantly has given to us? I once read about this image. And it sticks with me ever since. I pray that it sticks with you too. Just imagine that you are in the Kingdom of God, in this new Jerusalem, and Jesus, the Son of God, takes you and brings to a group of people saying: “These ones are here because of what you did with what I gave you.” What can be more rewarding?! I really don’t know. ← Only One Road to Heaven?